I'm trying to get an Operation Write Home box out of here today. 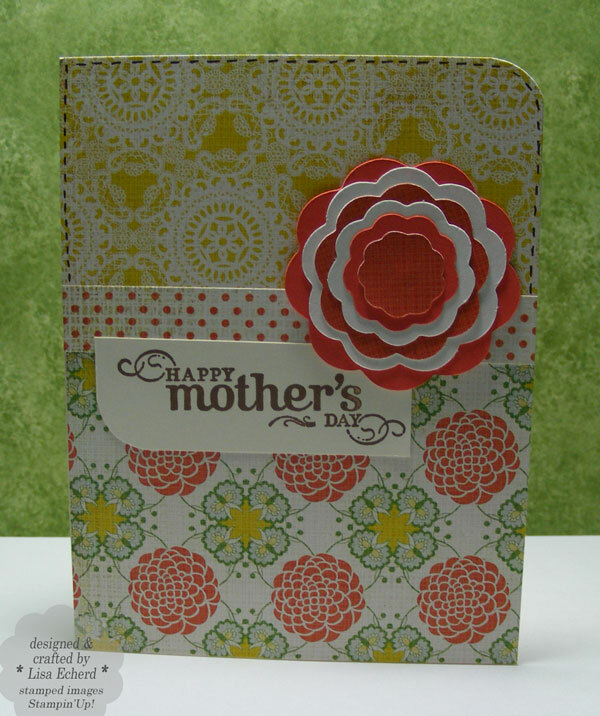 I wanted to include just a few more Mother's Day cards so I did these really fast last night. One project note: The flower is a series of graduated scalloped circles from the Accent Essentials cartridge on the Cricut. I just alternated the colors and how they were turned to create the flowers. Thanks for visiting. Tomorrow's TIPsy Tuesday is on recoloring brads. Ingredients: Stamps: All Holidays from SU! DSP: Basic Grey's Nook and Pantry 6x6 paper pad.